Whether you fly a lot, work in a noisy office, or simply love the stillness of a silent reprieve, QuietPoint headphones give you a listening experience free from distractions. The ANC70 QuietPoint headphones are lightweight and compact to effectively reduce distracting background noise by 90%, while offering the superior audio quality that has made Audio-Technica a worldwide leader in electro-acoustic technology. Ideal for use with smart phones, tablets, laptops, music or DVD players & in-flight entertainment systems, ATH-ANC70 QuietPoint closed-back headphones deliver clear, high-resolution sound, with intense bass, a detailed midrange, extended treble and accurate imaging in an immersive soundfield. When used with a smartphone, you can simply press the illuminated logo-button on the earcup to take a phone call or to return to your music or silence. A high-sensitivity mic has been built into the earcup, rather than the cable, for improved speech clarity and volume. Fixed-position mic maintains consistent distance from mouth for uniform volume level and eliminates noise from cable motion or rubbing on a collar. The earcups have been designed for greater comfort, with memory-foam padding and a shape that fits easily over any ear. The headband has been engineered to distribute mass evenly across the head, making it feel lightweight for longer wearing comfort. The ATH-ANC70 QuietPoint headphones feature large-aperture 40 mm drivers with a rare earth magnet system and extremely high 109dB sensitivity to provide generous volume levels from any music source. 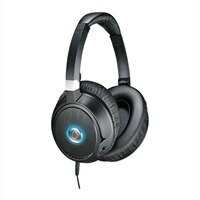 The headphones also work when the noise-canceling function is turned off, and operate in passive mode without batteries. Noise-canceling electronics are fully integrated in each earpiece, with no need for external modules. So now you can hear everything as it was intended. And absolutely nothing else. Find your QuietPoint.